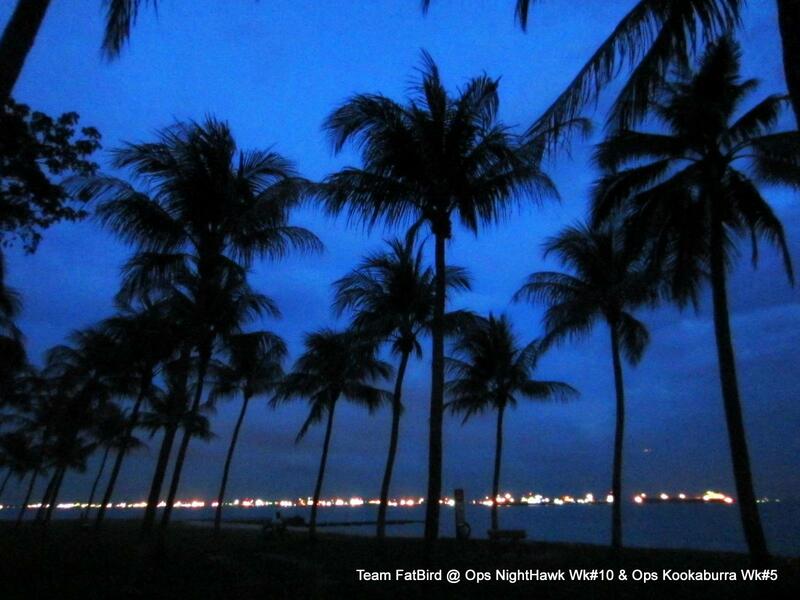 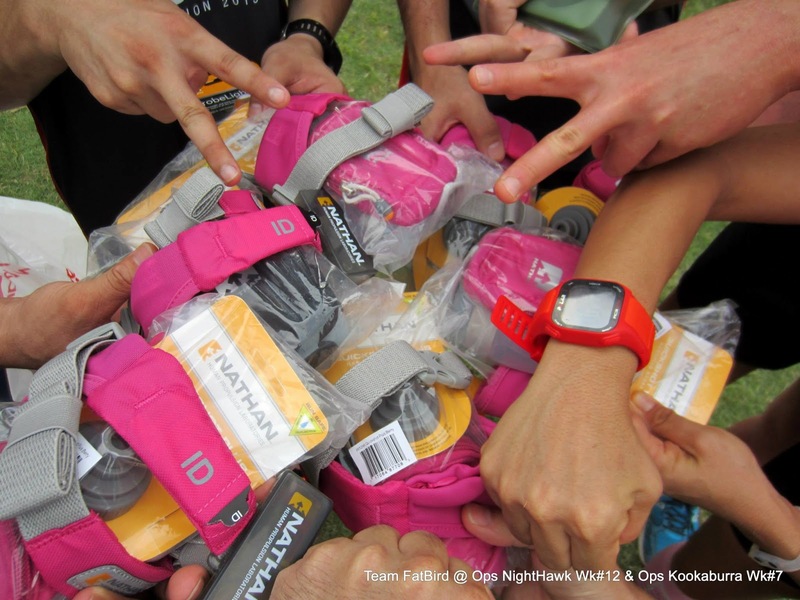 Operation NightHawk 2013 – All training and preparations logged and loaded…Counting down to the big night! 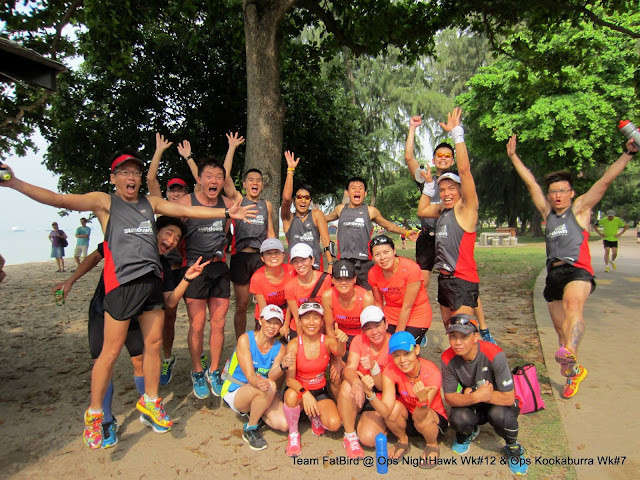 We Are Ready To Show Our True Colours @ Sundown Marathon Singapore 2013! 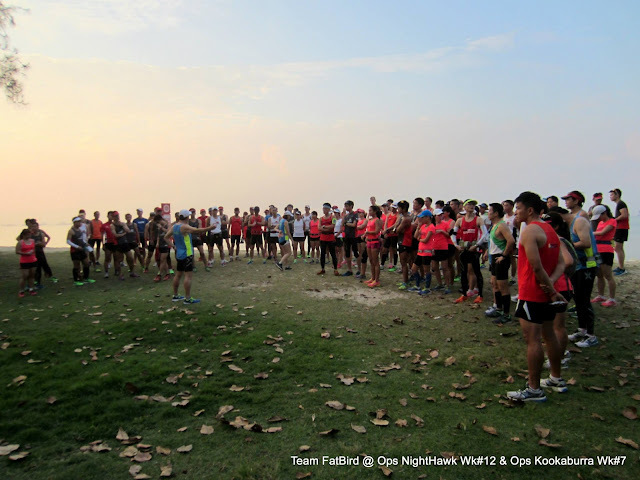 It was the day The NightHawks have been waiting for since they started on the 12-week training program to prepare for Sundown Marathon – the final session where every participant will don their race-gear for a full-dress rehearsal and run down the runway for one final time before wrapping up for the big show on May 31 and June 1. For this finale session, we started off as an entire group, with proper lining up of the different pacers with their respective pace groups. 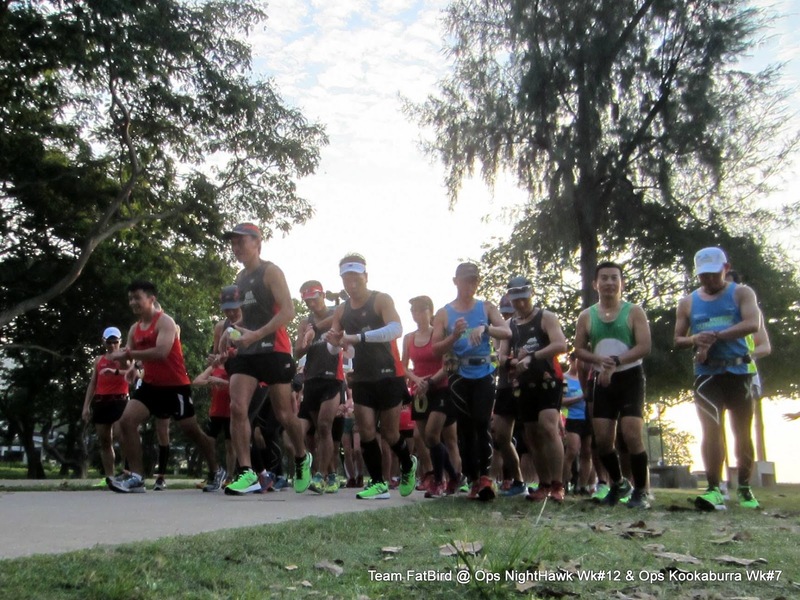 Every marathoner would then go with their groups at Optimal Race Pace, simulating race conditions as closely as possible, albeit in warmer morning temperatures but with better light conditions. Nothing was left to chances, and some Pacers even brought along balloons and timing bibs to do final testing…such is the dedication and commitment of these batch of Sundown Ambassadors who have put in their best with lots of sacrifices during their 15-week preparation journey. 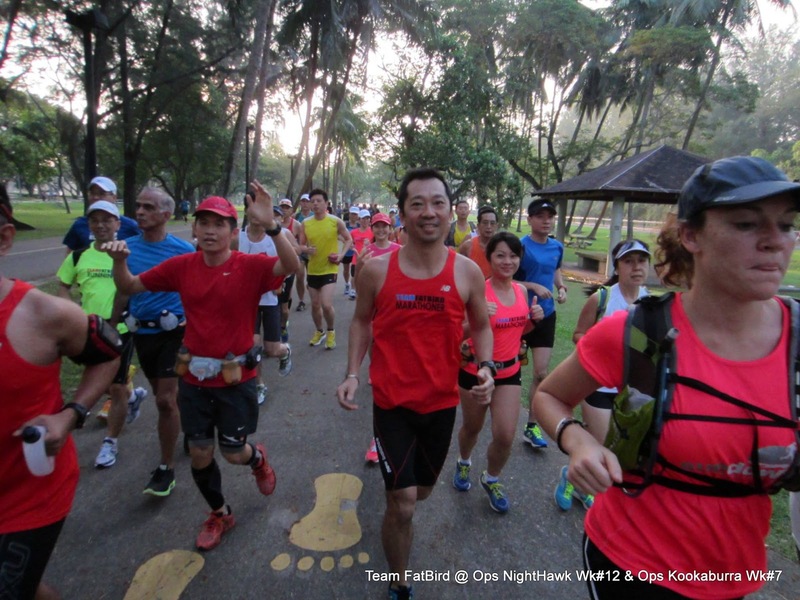 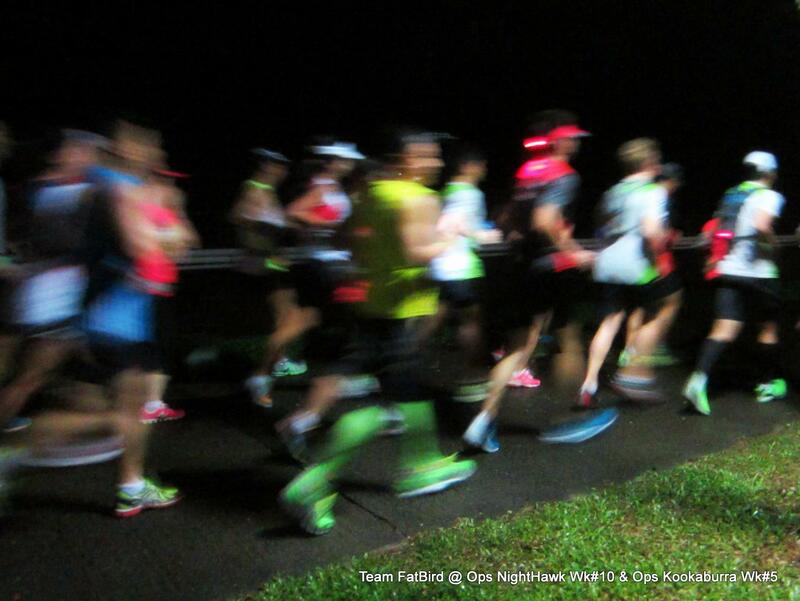 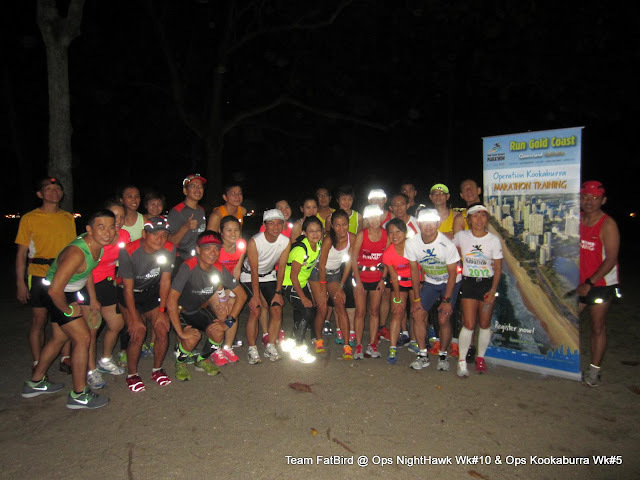 The time has come for all to bring their preparedness and confidence to peak levels, and after the 13-18km run, the spirit and motivation levels of all NightHawk participants reached a high, just nice for the main race in less than a week’s time. A quick post-training debrief and race-night coordinating meetings ensued, before Operation NightHawk was called to a successful close for all trainees and Pacers – it was a memorable 12-weeks of base build, lead up and pace runs complemented with lots of group runs which served to build camaraderie and team spirit that will surely leave us with many good memories even after the training and race is over. 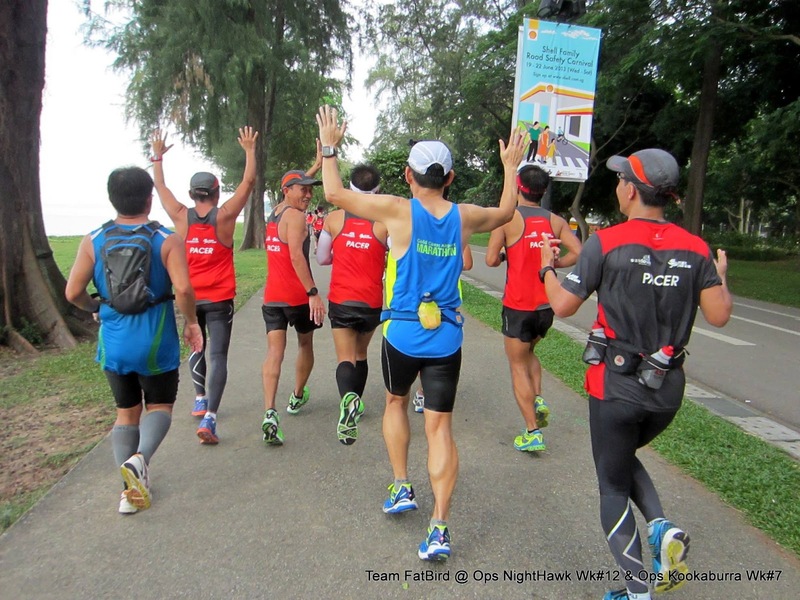 The friendships forged will remain for a long time to come, which has been evident from members of previous training operations. Such are the benefits of group training and preparing for ‘battle’ with many like-minded individuals which often make those long and hard runs so much more palatable and feasible for us weekend warriors and amateur athletes. 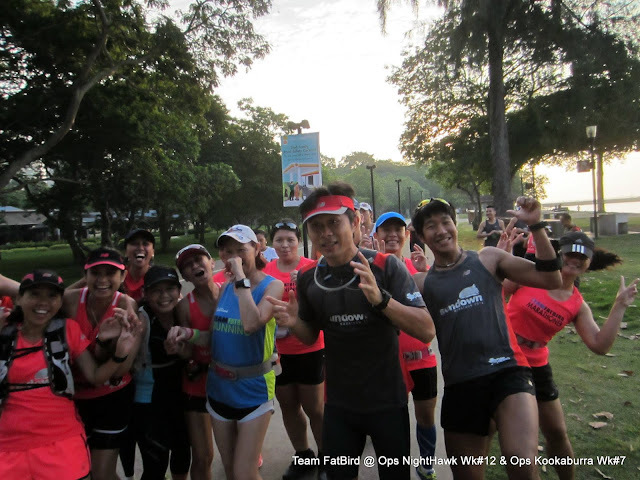 Team FatBird and Ops NightHawk training crew would like to wish all our NightHawks a great race at Sundown Marathon, and we are indeed confident that all who has attended at least half of the structured program will be able to meet mission objectives, with a good percentage even surpassing expectations. NightHawks, NightHawks Will Do Their Best! See You At Sundown Marathon! 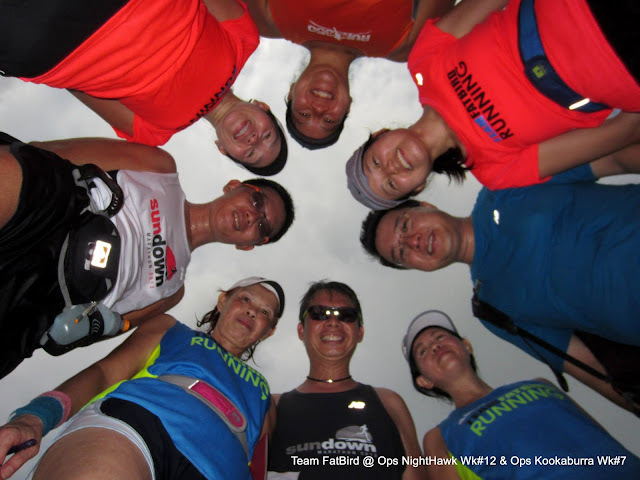 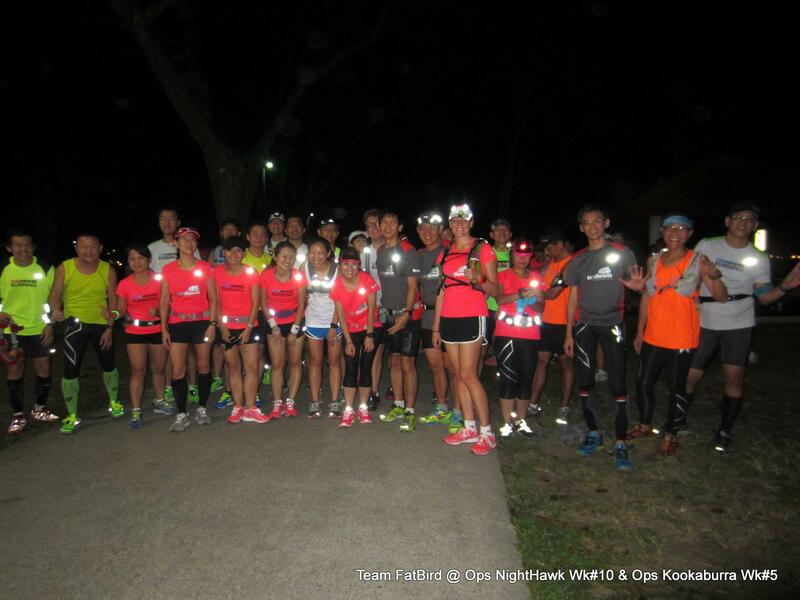 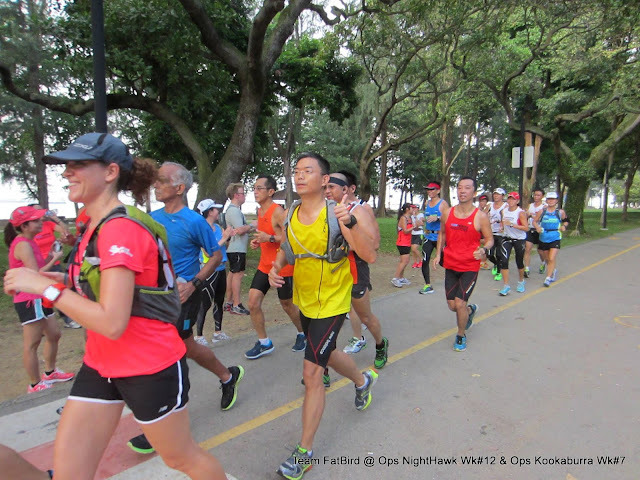 The Ops Kookaburra participants went into their 5th week of training with a nice cool evening weather along the East Coast of Singapore. 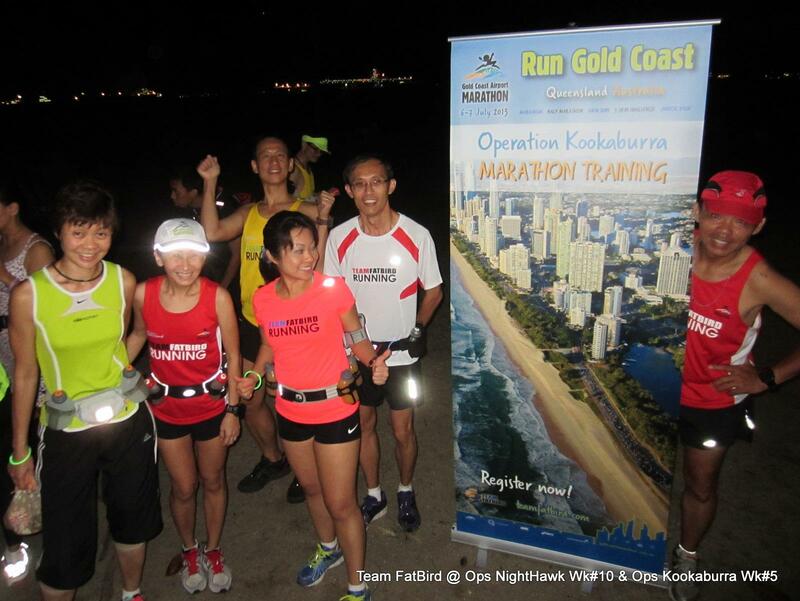 The 3rd time we are having a group session with these runners preparing for the Gold Coast Marathon on 6-7 July, the goupings are more or less settled with the night’s objectives to run a 16km and 28km distances in target Marathon Pace. 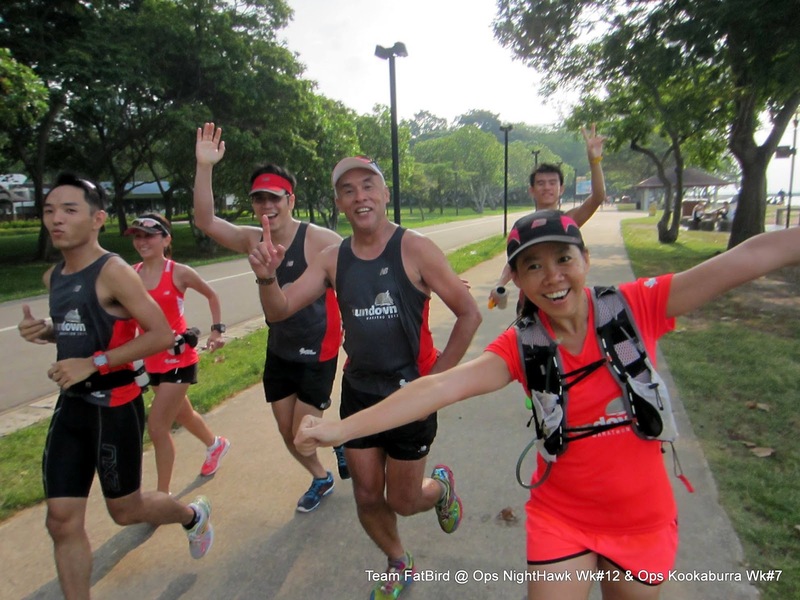 Along with the NightHawks (who are entering their tapering phase), the large group of trainees and Running Guides started together from C4. 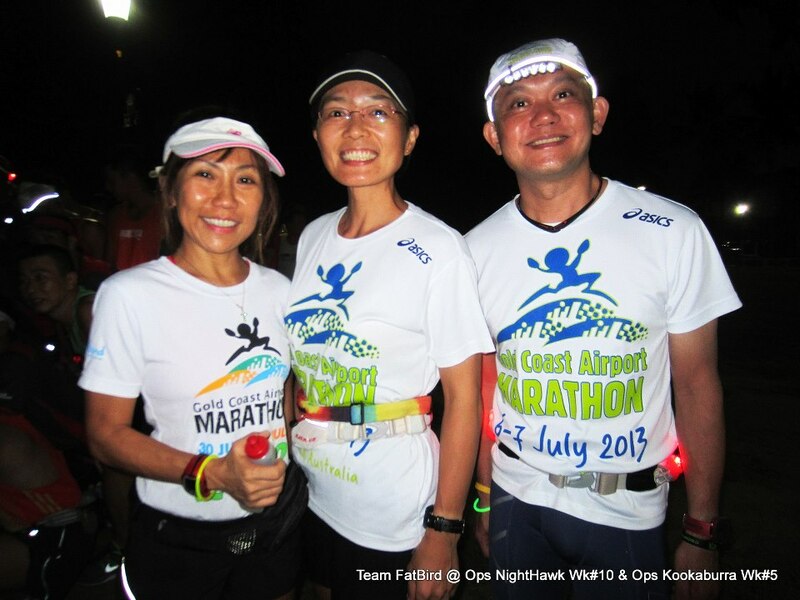 The area was already bustling with night activities leading into the weekend, with the beach goers, cyclists and runners already into their strides when we were setting up. 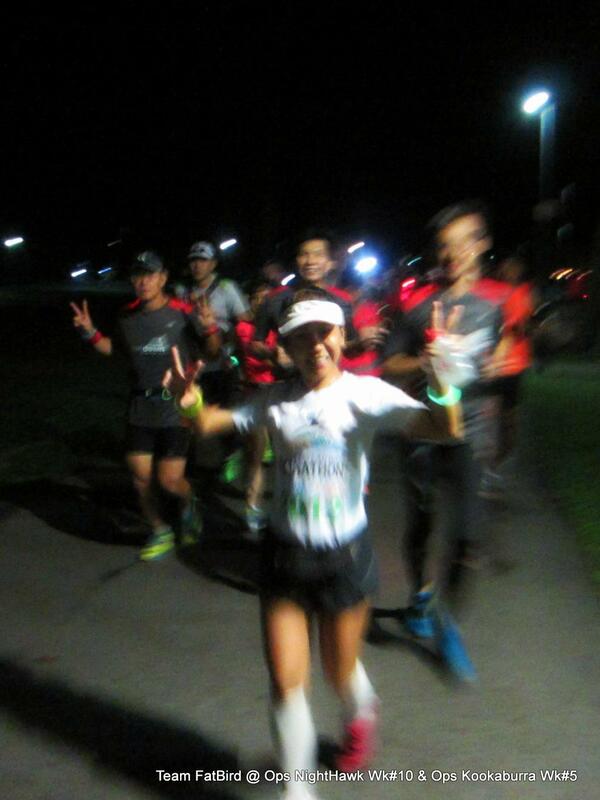 We managed to flag off by 8:15pm, heading straight for the familiar Fort Road in our respective pace groups. 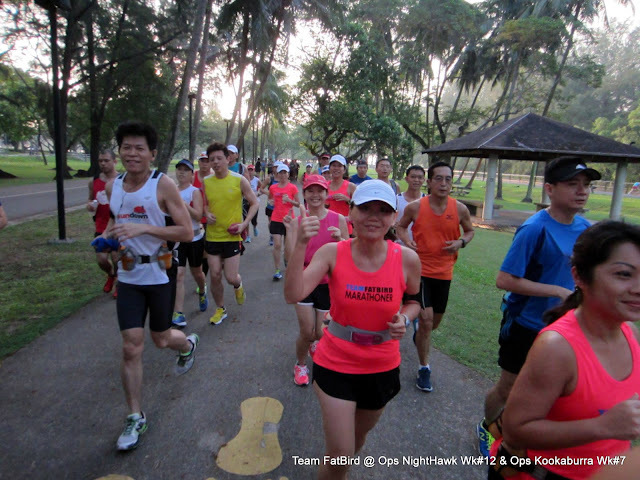 Although the Kookaburras were supposed to be slightly slower in paces than the NightHawks, it seemed many of them decided to fire ahead to test their abilities to sustain faster paces as gauges to help find their right pace groups. A couple of Kokaburras headed into sub Group 1 category, while the Pacers maintained their Optimal Paces to serve as a guide for the runners’ training. The night air was rather cool after the late afternoon showers, and although more rain threatened, we were fortunate to maintain status quo. 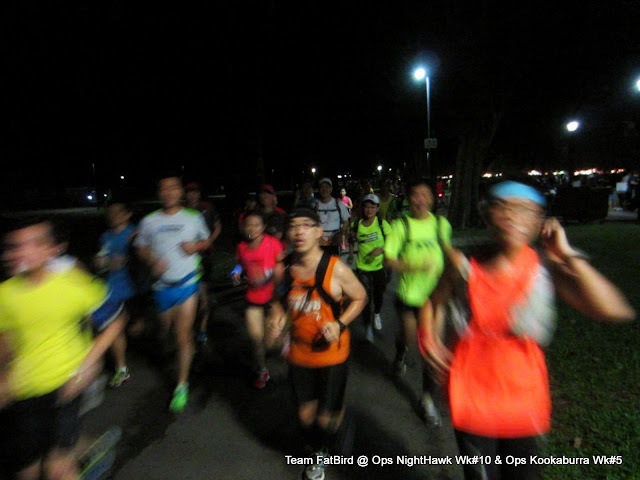 Many of the trainees were able to sustain a good pace for up to 18km, then pushing on to 22km-24km without any threat of drifting off. 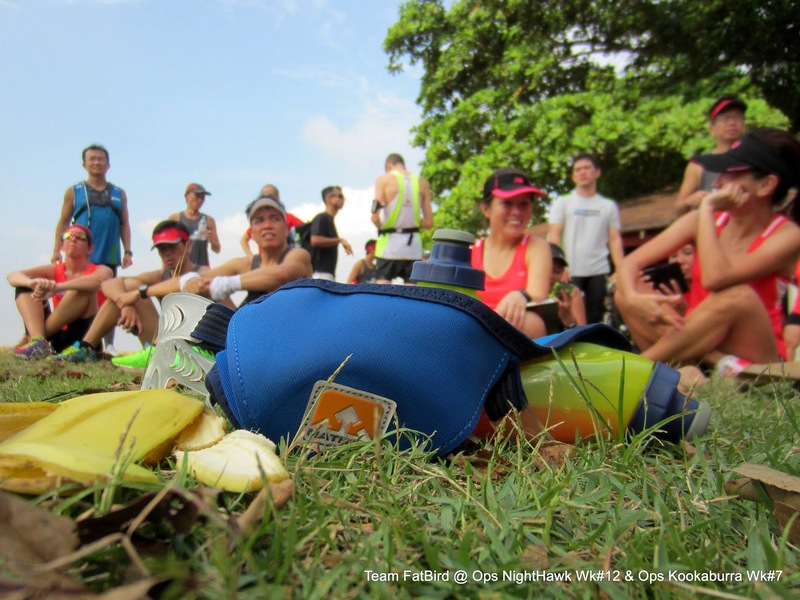 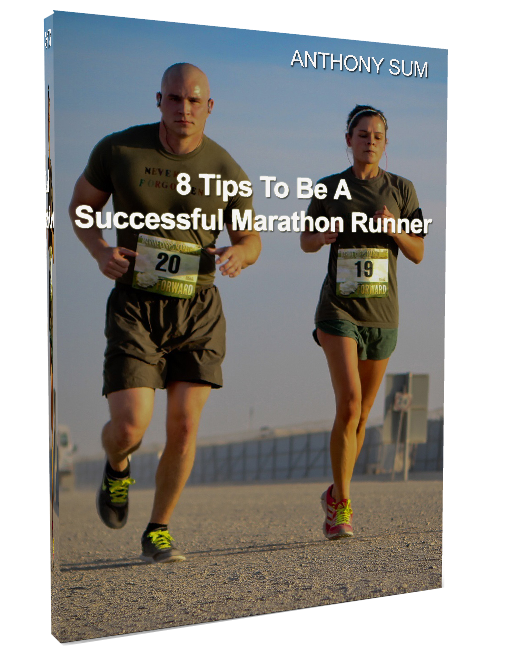 Hydration, nutrition and pace plans were put into serious practice to go along with the endurance building which should contribute to the proper progressive conditioning of the runners at target speeds in increasing longer distances. 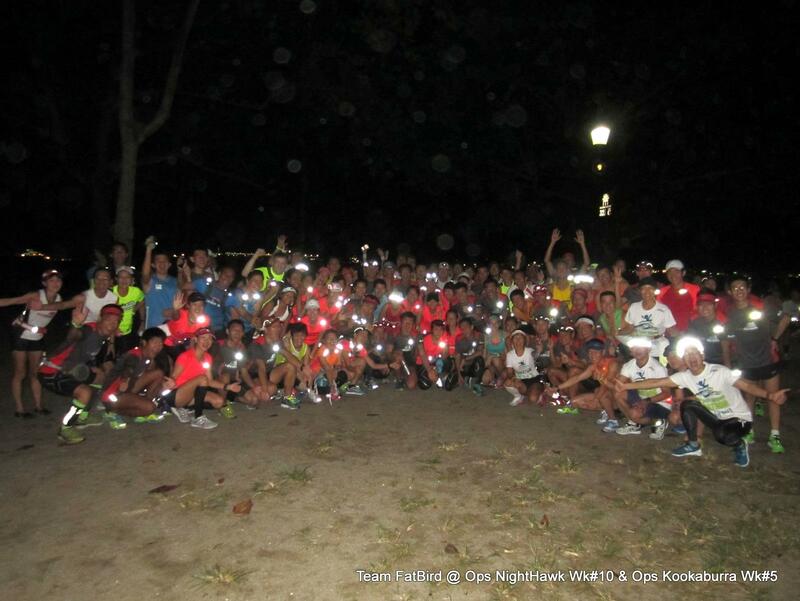 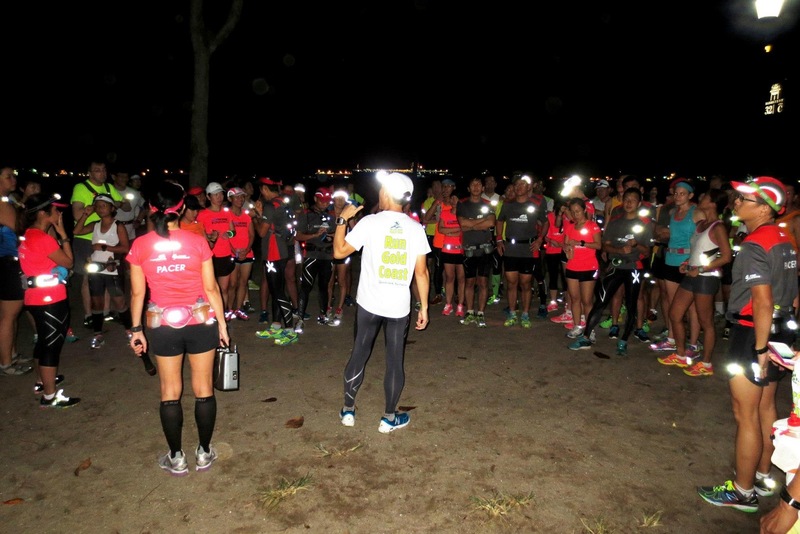 The night was rather dark, leading to the runners focusing on the job at hand, and less of making merry – most all were rather serious in stretching their thresholds and testing out their race plans. 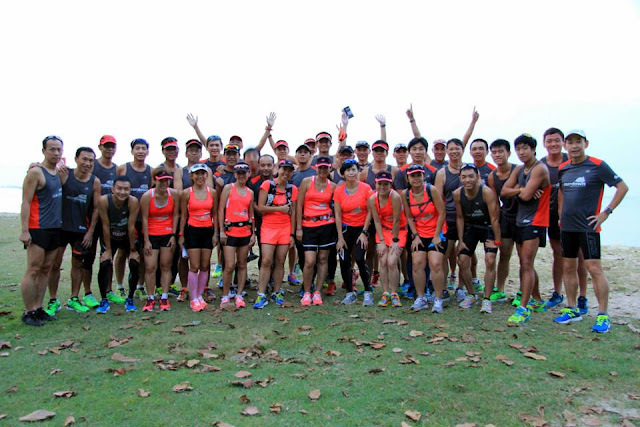 Running in groups went a long way towards helping the runners to keep motivated and focused in maintaining their paces, although it got to be rather challenging at the ‘mentally-demoralizing’ Coastal Road stretches. 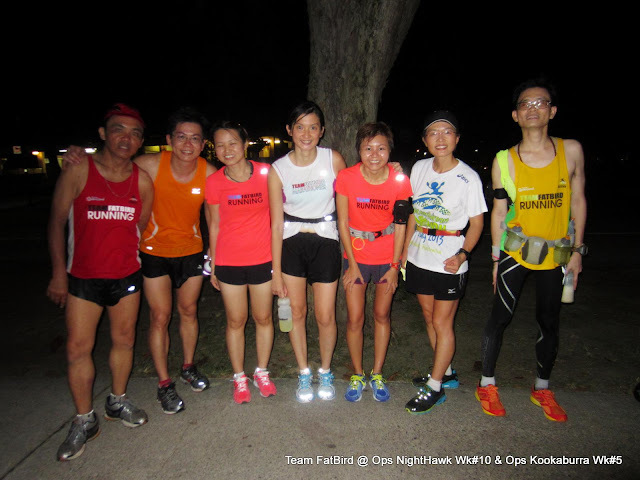 After the U-Turn at the specified point along Coastal Rd, it became better as we strode towards NSRCC and then to the Sailing Centre. 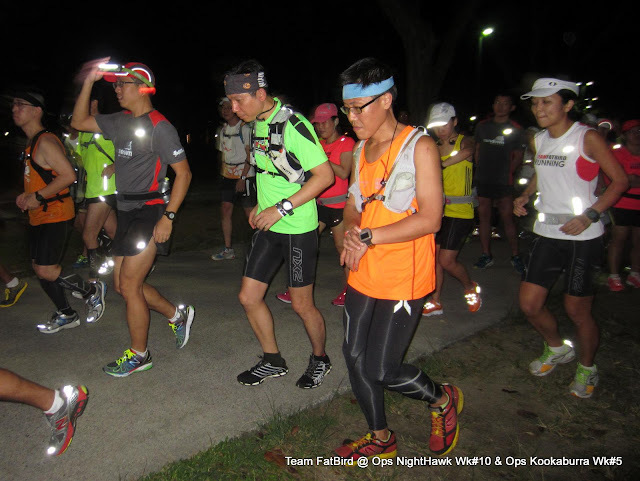 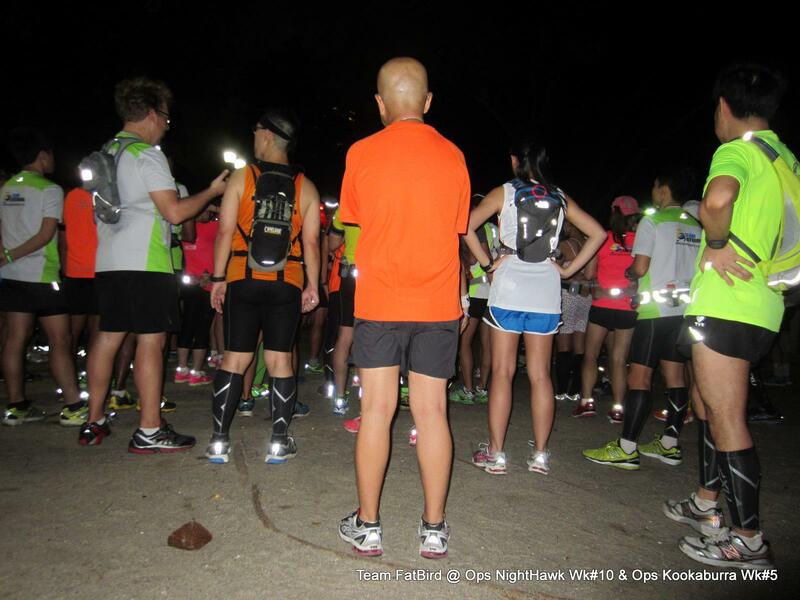 With about 6km to go, all runners were feeling strong enough to continue with target MP and proceeded to the end point at C4 without much stropping, bar the quick toilet breaks for some water for hydration and cooling off in what was turning into a humid night. By 11:30pm, 3.5hrs after running, all Kookaburras returned in reasonably good form, achieving what they had set out for the night. A good majority of the Kookaburras are also using the upcoming Sundown Marathon at end May as a longest run to form a time trial of sorts, and also final longest run before tapering kicks in from June. 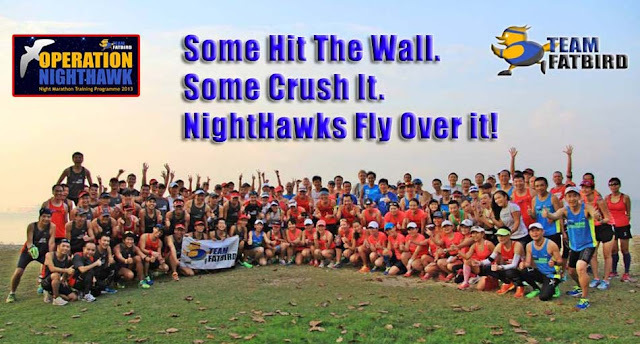 The current flock of Kookaburras look to be on firm ground as we progress, while the NightHawks are well conditioned for a good night at Sundown Marathon. With the increasing instances over the past few weeks, there have been more reports of tightening muscles and pulls and pain in various parts of the legs; an indication that some time has to be spent recovering from the long runs, and more importantly, doing the R.I.C.E. 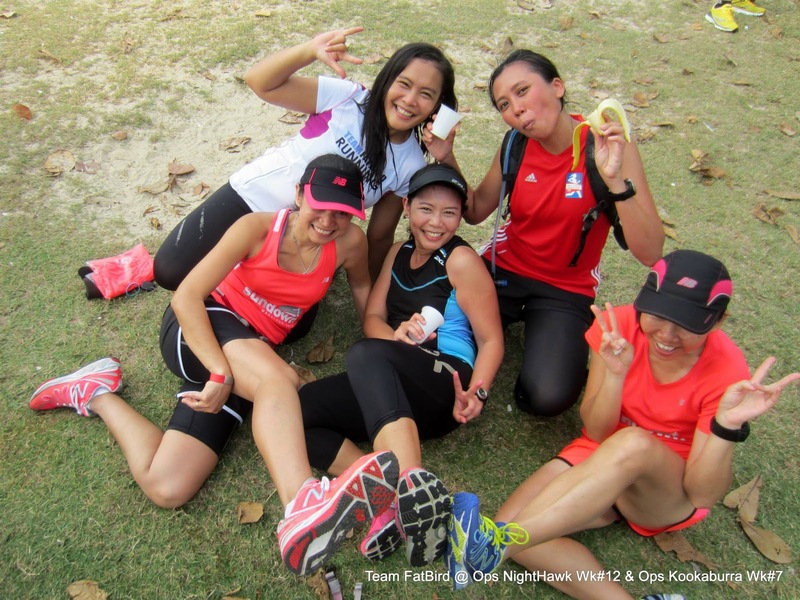 treatment coupled with post-run stretches and even regular myofascial massages. The Kookaburras will be doing their own training on week #6 in accordance with the prescribed training schedule. Team FatBird trainers will be back with them in Week #7 when we will be tackling the 30km+ distances at target MP moving towards Team FatBird’s Optimal Pace Plan. 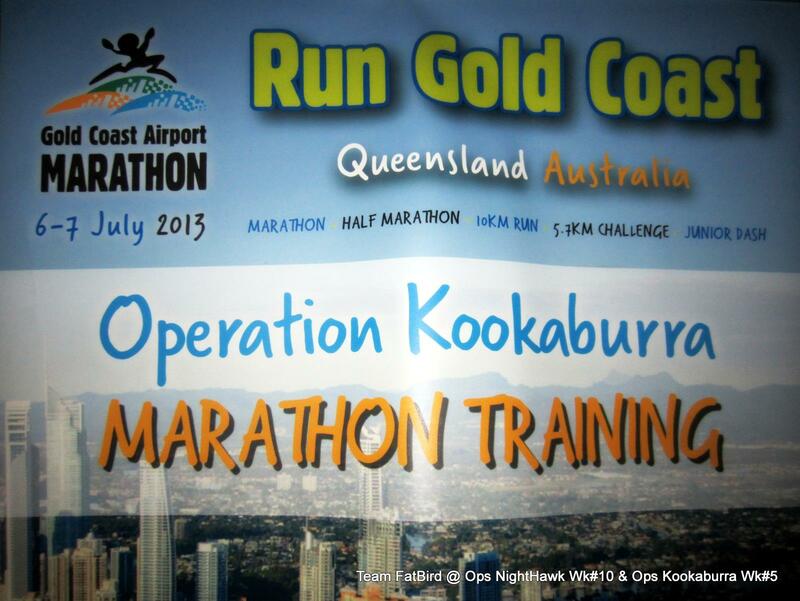 We have good confidence that the Kookaburra trainees GCAM 2013 will come out tops on race day. 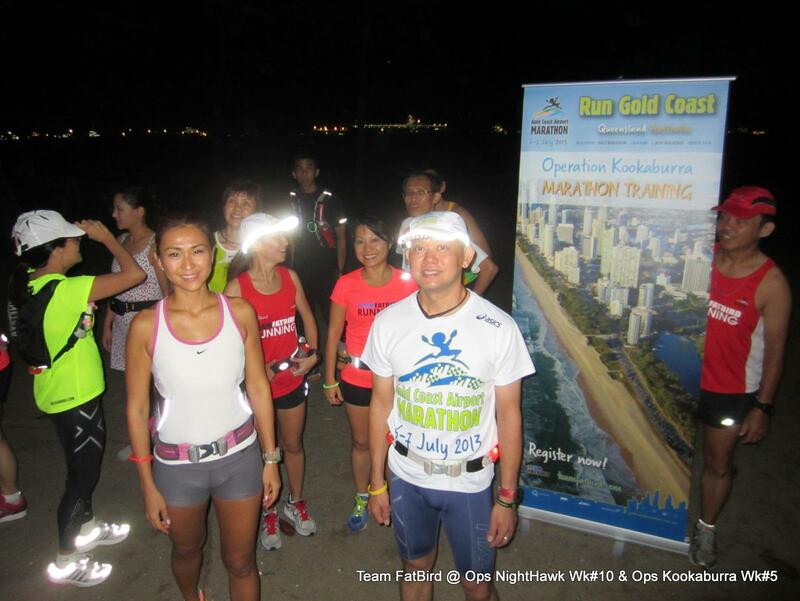 Gold Our Race Will Be!